Luke 24:1-12 But on the first day of the week, at early dawn, they came to the tomb, taking the spices that they had prepared. 2 They found the stone rolled away from the tomb, 3 but when they went in, they did not find the body. 4 While they were perplexed about this, suddenly two men in dazzling clothes stood beside them. 5 The women were terrified and bowed their faces to the ground, but the men said to them, “Why do you look for the living among the dead? He is not here, but has risen. 6 Remember how he told you, while he was still in Galilee, 7 that the Son of Man must be handed over to sinners, and be crucified, and on the third day rise again.” 8 Then they remembered his words, 9 and returning from the tomb, they told all this to the eleven and to all the rest. 10 Now it was Mary Magdalene, Joanna, Mary the mother of James, and the other women with them who told this to the apostles. 11 But these words seemed to them an idle tale, and they did not believe them. 12 But Peter got up and ran to the tomb; stooping and looking in, he saw the linen cloths by themselves; then he went home, amazed at what had happened. Note-taking. Now there’s a topic filling sanctuaries across the land today. You know, note-taking…jotting something down to remember something for later. It shows up in our day-to-day in one form or another. In a meeting a work. In a class at school. In a kitchen at home. Or, even, in a church sanctuary near you. One of the things I get to do with this church is read sermon notes written by our confirmation students who are in the 6th through 8th grade. Yvonne and I both read their notes and write comments or ask another question in response to what’s been written. These sermon notes are treasures. As students, there’s a time to be honest about what is heard. As families, there’s a chance to talk about faith in a different way. As a preacher, I learn a lot about how my sermons are heard – or are not hearable. As a pastor, I learn a lot about what these young people are thinking about life, faith, and church – beyond what they tell me during the Children’s Sermons on these steps every Sunday. These intrepid women from Galilee. Mary Magdalene, Joanna, Mary the mother of James, and the others were are there. We’re told just earlier in the story that “the women who followed him from Galilee” were lurking about at the crucifixion, watching Jesus take his last breaths “from a distance.” We’re told that these women who “had come with him from Galilee” were watching when Jesus is taken down from the cross by Joseph of Arimathea. 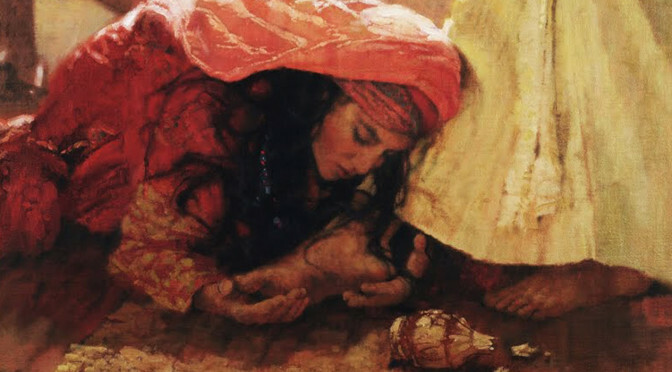 “They saw the tomb and how his body was laid.” Apparently, he was laid to rest without the rituals of burial because these intrepid women of Galilee left the tomb and “prepared spices and ointments” in the time remaining before the required rest on the Sabbath. We pick up the story on the first day of the week, after the Sabbath, when the women from Galilee return to the tomb to pack Jesus’ body in spices. His body is not there. The tomb is open and empty which they find perplexing. Angels dazzle them and the women drop face down in terror. The angels ask them that great question, “Why do you look for the living among the dead? 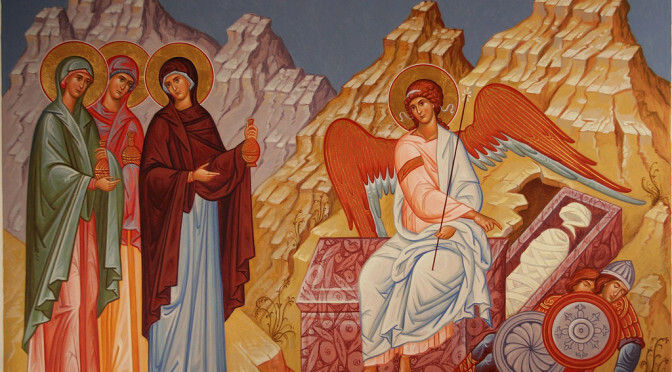 He is risen.” Then the angels go on to say this really great thing, “Remember how he told you in Galilee…?” And they remind the women that Jesus had told them he would die and rise again. It made no sense the first time they heard it from Jesus. Standing in the empty tomb, it’s sinking in just a little differently. Then they remember what Jesus had said while still alive. Isn’t that the way of hindsight? We often don’t know what to make of something until more time passes and more information is available. Until we are reminded and have others to offer a new perspective on what we think we already know. The intrepid women from Galilee head out from the tomb to tell the guys what happened. “They told all this to the eleven and to all the rest…But these words seemed to be an idle tale and they did not believe them.” Idle tale is a cleaned up version of the Greek word leros – garbage, drivel, baloney are euphemisms that get close. Keep adding to the list and you’ll start adding words that are more like the salty speech of sailors or what farmers cart around as fertilizer. You can almost hear the eleven and the others saying to the women and each other, “That’s leros!” The only time it’s used in scripture is right here, in Luke. A pithy, disrespectful response to the women’s report. Those closest to Jesus can’t fathom the resurrection. Jesus had told them about it during his ministry. 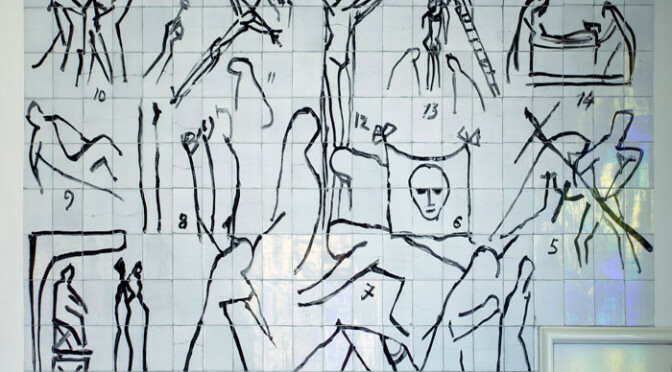 They had been in Jerusalem and either watched or knew about Jesus’ execution. They knew he was dead, entombed. But, regardless of what Jesus told them when he was alive, they know that the dead stay dead. Of course they do. It’s what makes sense. Yet, the intrepid women of Galilee start chipping away at that truth. In response to “that leros,” Peter races to the tomb and returns home amazed. The story says nothing about his belief. Another confirmation sermon-note writer recently asked, “Is it okay to be skeptical about God and his works?” To which I would answer that skepticism finds good company with Peter this week…and next Sunday also as we’ll hear about Thomas’ unbelief. For today, though, the intrepid women from Galilee are the real standouts. They stuck around at the cross. They showed up at the tomb. They go from perplexed, to terrified, to preaching, within a short period of time. They remember what Jesus told them before he died and are no longer looking for the living among the dead. A greater truth has broken through. Death is now the idle tale. By the power of God, the dead don’t stay dead. In many ways the truth of the cross is closer to home than the resurrection. It’s a truth we get deep in our gut. The truth that being human involves real times of suffering and pain. The truth of God’s self-sacrificing love. The truth that God would rather die than raise a hand in violence against the world that God so loves. The truth that forgiveness comes from the cross as Jesus says, “Father, forgive them, for they know not what they do.” The truth about the unflinching love of God in the face of our failures. Those are hard truths but we can get at them from our own experiences of love, forgiveness, self-sacrifice, pain, suffering, and death. Resurrection. Now that’s little more slippery. A God who brings life out of death is unpredictable…destabilizing. Here’s what I know. Twenty years ago I had spent a decade outside of the church and was a decade into my work as a nurse. I would have laughed at you if you told me I’d be a Christian preacher. There was a lot that had to die inside of me and God is not done yet. You see, idle tales are easy. The leros piles up everywhere and we love getting out our shovels to heap it higher. We tell idle tales in our personal lives as we hide our secrets. We tell idle tales as we form our families with unrealistic standards of perfection. We tell idle tales at school and work as the striving creates unlivable pressure cookers out of our lives. We tell idle tales as we talk politics. In contrast, the truth that God loves the world so much that “the Son of Man must be handed over to sinners, and be crucified, and on the third day rise again” is a story that saves in the here-and-now. The saving story is the love of God who lived and died and lives again as Jesus the Christ. That leros that you protect so carefully? Watch out, God wastes nothing as despair is turned to hope and as death is turned to life. Luke 24:11 But these words seemed to them an idle tale, and they did not believe them. Anna Carter Florence, Preaching Moment on WorkingPreacher for June 2, 2008. Mary and Joseph are faithful, religious parents. Part of what this means is that they bring Jesus to Jerusalem at the designated time in infancy to present him to the Lord. Reverent and expectant, they likely approach the temple with the kind of anticipation many families approach the baptismal font. It is a big day in the life of this small, holy family. Into the city of Jerusalem they go, winding their way through town and into this holy place. They’re not entirely sure what will happen but there is ritual that can be anticipated. What couldn’t be anticipated is Simeon. It’s easy to get swept away into the beauty of Simeon’s Song along with its heady lyrics. He sings about God’s salvation in the presence of all people, Jew and Gentile alike. Simeon’s excitement is infectious. 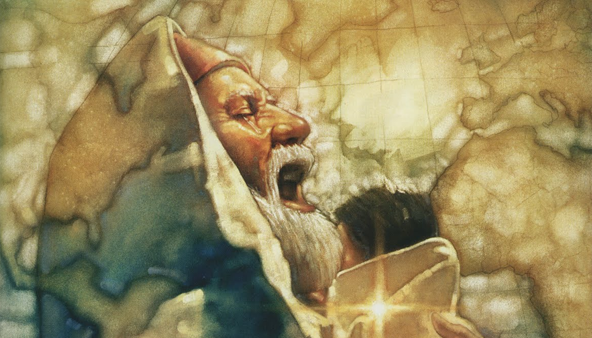 Art work depicting Simeon singing to the baby Jesus is filled with joy, awe and tears. What’s easy to miss is that Simeon is ready to die. This song is entitled the Nunc Dimittis which means in Latin, “Now send away.” It’s a song sung in Communion liturgies and compline prayers at the end of the day. It’s a song of comfort but it is also stark. Simeon is so faithful and so ready to die. Phil’s choosing of his own funeral scripture gives us a glimpse of his own faithfulness. He chose more scripture than is included today. A bit like he couldn’t stop once he got going on it. The main theme across the scripture he chose is God’s faithfulness. All about who God IS. God’s faithfulness, not our own. And, yet, the many stories I’ve heard about Phil from Kevin and others of you, are a testimony to Phil’s faith. A favorite story, told by Phil to Kevin, is one from when Phil was very small. Small enough to be lifted onto the counter by his parents. Small enough to lean into them as they leaned toward him so that they could share in their “three-corner kiss.” Phil was raised by faithful parents who shared their love of him and their love of God with him. As a baby he was baptized in the sacrament that washed him in God’s promises. Phil trusted in God’s promises along the way – as a child of the Depression, as a soldier in the Army, as a business and music major in college, as a husband of sixteen years who lost his wife to cancer, and as a choir member totaling 64 years of his life. God’s faithful promises were lived in and by Phil as he became a Stephen Minister as well as a long-time home communion visitor – taking hope and forgiveness through the sacrament of Holy Communion to people who could no longer get to church. Along with these ministries, many of you shared with me that Phil would call you on your birthday. Kevin told me that Phil would take the birthday lists from the church newsletter so that he could track and celebrate your birthdays with a phone call. Such a gift. Ultimately, Phil’s faith was a gift. A gift to him from God that continued to give to the people around him. Living his gift of faith came with the clarity about his own imperfections and the limits of his humanity. He worshiped Sunday after Sunday with the awareness and humility of someone in need of a savior. He worshiped to hear Jesus’ promise of forgiveness and love again…and again…and again. In the end, Phil was ready. His body and mind as fragile as his tattered, well-worn Bible with the pages falling out. When we were baptized in Christ Jesus, we were baptized into his death. We were buried therefore with him by baptism into death, so that as Christ was raised from the dead by the glory of the Father, we too might live a new life. For if we have been united with him in a death like his, we shall certainly be united with him in a resurrection like his. This is God’s promise for Phil as his baptismal journey on earth ends with his death and he is received into the peace of a loving God. And this is God’s promise for you. You are now dismissed in peace, according to the Word of God. Amen. Evangelical Lutheran Worship (hymnal). Life Passages: Funeral. (Minneapolis: Augsburg Fortress, 2006), 280. Isaiah 12:2-6 Surely God is my salvation; I will trust, and will not be afraid, for the Lord God is my strength and my might; he has become my salvation. 3With joy you will draw water from the wells of salvation.